In this fast-moving world, Meghalaya inspires us to pace ourselves with Slow Food. If there's one thing you do this week, pack your bags & go feast at Shillong's Slow Food Festival. Meghalaya has something to offer that the world badly needs. In a nutshell, that's what I learnt at the curtain raiser to Meghalaya's slow food festival held at New Delhi's Meghalaya House on Saturday. The 'Indigenous Terra Madre 2015' which will be hosted by 41 villages of Meghalaya from 3rd to 7th November 2015, invites your taste buds to explore the state's most savored Khasi, Garo and Jaintia indigenous recipes. Here's why you should go. How do you showcase the cuisine and culture of three tribes living in 41 villages over one dinner? Rows and rows of bamboo boats are being filled with Ja Pashor which is steamed rice flour pancakes, topped with a mixture of shredded chicken and egg seasoned with shallots, local ginger, turmeric and pepper. 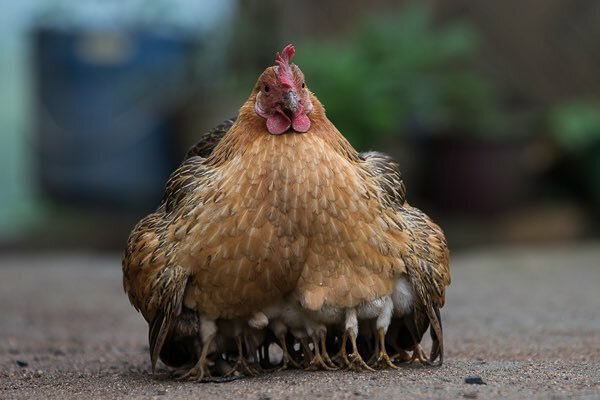 The vegetarian version of it uses banana florettes instead of the chicken. These are topped with a tangy chutney made of tree tomatoes and garnished with wild herbs. Then there's terracotta plates full of what looks like a bonzai forest piled on each one with tender roots, leaves and stems looking fresh and exotic. Tyrkhang Khlaw Sdieh is made of fresh wild ferns tossed with garlic and local spices. "Our food is about using a lot of natural ingredients which you can get by just walking into your backyard to pluck the leaves of your choice. When there's meat it's slow cooked for a long time," says 36 year Chef Daniel Syngkon, who is half khasi and half Jantia, who is the head chef for the evening. The Doh Sniang Lung siej is undoubtedly everybody's favourite. Its traditionally fermented bamboo shoot cooked with prime cuts of pork and a hint of jaiur and local bird's eye chilli. The pork was slow cooked, simmering on a low flame for over 4 hours. 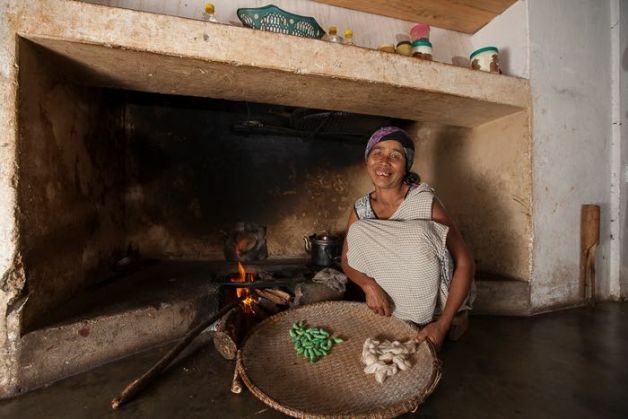 But Slow food isn't just about cooking on a low flame explains Eva Gunme Marak, a custodian farmer and community cook, from south west Garo hills of Meghalaya, while expertly wrapping hot sticky rice with banana leaves. "It's the entire process from growing and cultivating organic food, in complete harmony with nature, to various traditional processes of preserving it, to finally giving the ingredients time to cook to perfection," says Marak. Some dishes like rice beer can take months or sometimes even years to prepare. A type of rice beer takes 7 years to ferment. "This old rice beer is such an exotic luxury even for us locals, it's rare," explains Mary Cornelia, press secretary to the Chief Minister Mukul Sangma. Dry fish can take 6 months to prepare. Smoked meat up to 2 weeks. Hand pound rice cakes or Pittha can take 3 days to make. And an average everyday meal in a Meghalayan home takes at least 3 hours to prepare. The Slow Food movement, today 100,000 members strong, began in 1989 in Bra, Piedmont, North Italy. Its founder Carlo Pertini, who was named a "European Hero" by Time magazine in 2004, and "50 People Who Could Save the World" by The Guardian in 2008, spoke of food sovereignty at the curtain raiser in Delhi explaining how Intensive farming by large companies is destroying our food communities. "Indigenous food communities are not just folklore, they safeguard our tradition and so represent real modernity," he said. The slow food movement is based on three principles. Food should be good, clean and fair - meaning tasty, grown with no chemicals and produced with no exploitation. But back in Meghalaya, these weren't values they learnt from Italy. These principles had always existed. Mukul Sangma, Meghalaya's Chief Minister, saw in the movement, a perfect resonance with what was already ingrained in the culture of his people. In an inaugural speech to the festival, Sangma called this an opportunity for Meghalaya and the rest of the North east to "connect with the world and listen to each other" and exchange "great stories". 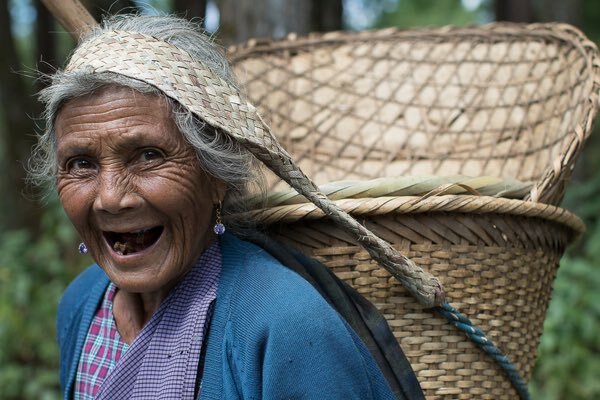 "In the lap of Mother Earth" is a photo series on display at the Meghalaya house on the people of Meghalaya, shot by 35 year old Andre J Fanthome. In the 10 days that Fanthome spent shooting in Meghalaya, apart from the images, he says he came back with several layers of fat acquired from the exotic food he ate throughout the trip ranging from fried silk worms to dried pork. "If there was one thing that stayed with me from my visit, it was just the harmony with nature in everything people do," says Fanthome. Fanthome's photos capture exactly that. 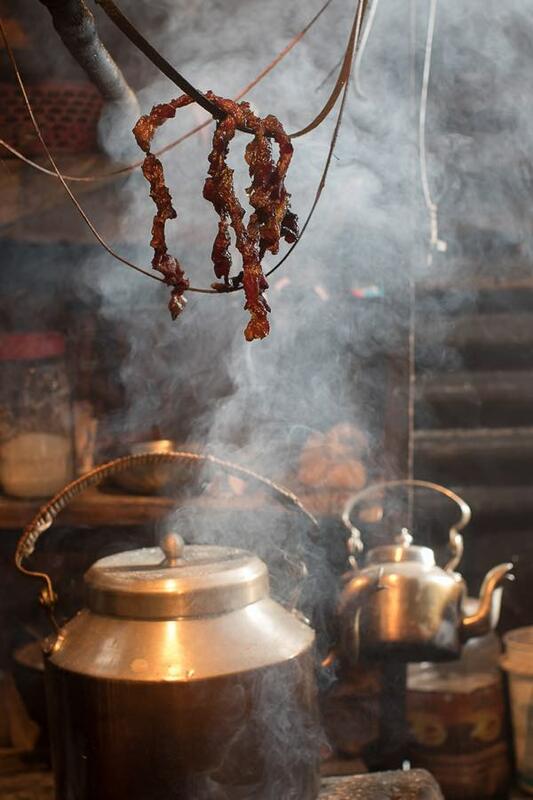 Through his photos you can see the rural smoky kitchens, typical in most households, with a steaming kettle, sitting on a burning log of wood, and how the smoke of it all wafts up reaching the meat hanging delicately on ropes just a few feet above. Over a week or two, the meat, either pork or beef, gets smoked to perfection. 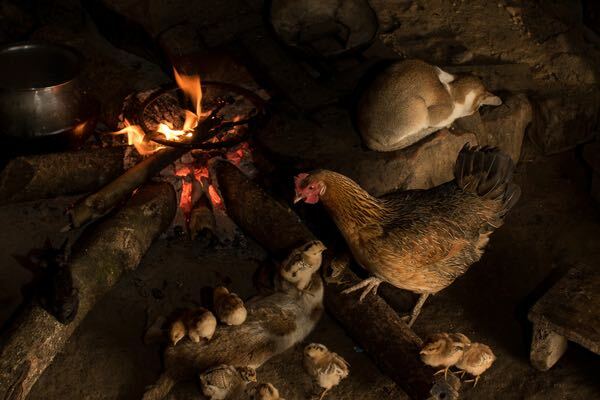 Meanwhile, just beside the glowing log, lie two lazy cats, a fat hen and its half a dozen yellow chicks walking over the logs and cats, the whole arrangement in perfect harmony to man, animal and nature. "The cow is a very important animal for us. Most of our rituals are related to the cow. Beef is one of our most important traditional foods," says Marak. Matchu tangsek pura, a common household dish is smoked beef with grilled vegetables in rice flour sprinkled with ash water. "We love our beef. If someone tells us not to eat beef, we'll never ever leave Shillong only!" says Syngkon laughing. So what can you expect this festival? The festival will be held at magical sacred groves at Lawkyntang, Mawphlang, a small town located about 20 kilometres away from Shillong. 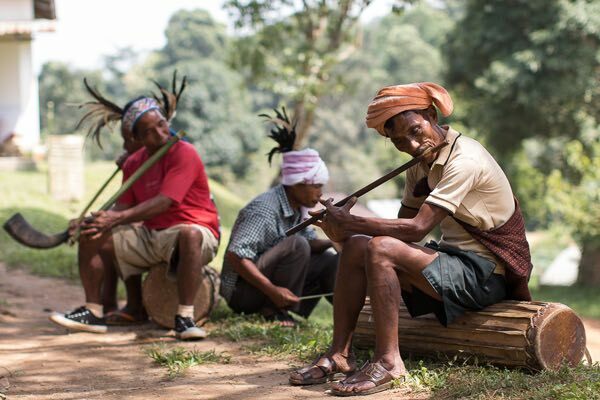 Over five days, representatives of 60 tribal groups from 80 countries will participate in a melting pot of an indigenous cultural exchange in Meghalaya. Apart from indulging in a culinary feast, the five days will see cultural activities, displays of the state's agro bio diversity, exhibitions of local produce, interactions with different communities, and much more. 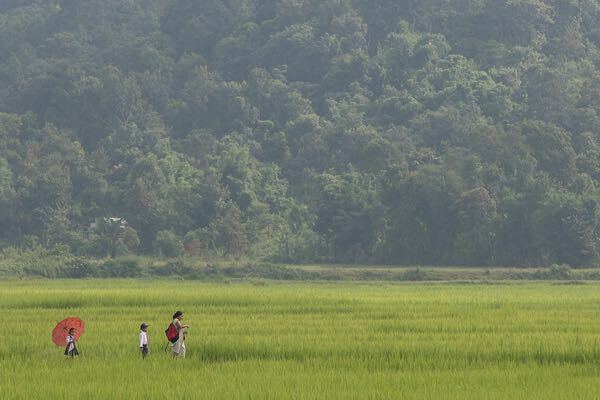 The Government of Meghalaya, North East Slow Food & Agrobiodiversity Society (NESFAS) and Slow Food International have partnered with the indigenous people of Meghalaya's 41 villages to make this possible. Pack your bags and go. You'll learn to slow down and live each moment to the fullest. In today's jet set pace, that perhaps, is the most valuable lesson Meghalaya has to offer. 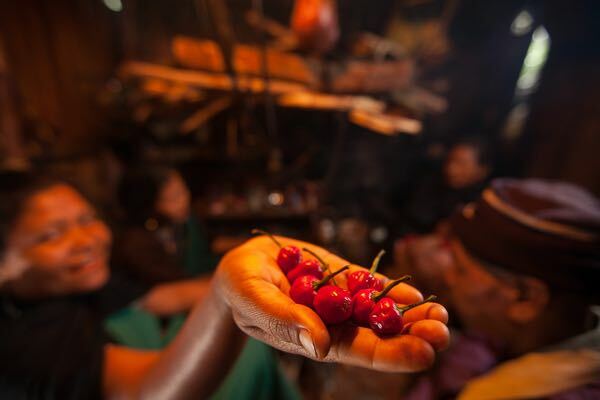 TWEET THIS In this fast-moving world, Meghalaya inspires us to pace ourselves with Slow Food. If there's one thing you do this week, pack your bags & go feast at Shillong's Slow Food Festival.